Okay, that was quite a blow. But now that we know that we can not get rid of stretch marks but can make them fade, let’s dig in and find out how we can do this. But first of all, a quick run through on what causes stretch marks. Short personal story first- My stretch marks didn’t appear until I was pregnant with my first child about 13 years ago. When the stretch marks first appeared on my skin, I was mortified because my tummy looked like a warehouse for lightning bolts! Stretch marks usually appear when one drastically loses or gains weight and in other cases, they are caused by one’s genetic composition and stress levels. Both men and women are prone to stretch marks and the colour of stretch marks varies from person to person. 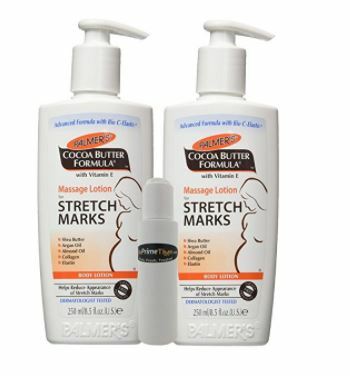 When it comes to reducing stretch marks, nothing beats Palmer’s Cocoa Butter Formula. The product is readily available on Amazon in packs of one or two. Yes, the smell of the cocoa butter is quite overpowering but you have to learn to get used to it because the benefits outweigh the strong smell. I have allergies but the smell does not affect my allergies at all, so this is a good thing. That aside, Palmer’s Cocoa Butter works magically to remove stretch marks and I see results in just two weeks of daily use. Give this lotion a try and you can thank me later! I had in the past tried Bio-Oil because a lot of people recommend it for reducing the appearance of old and new stretch marks, and scars. I have to honestly say that Bio-Oil does works for stretch marks and smells way lot better than cocoa butter. It just does take a bit longer for you to see results (longer than cocoa butter), but you will see the results if you practice a little patience. I am not a patient person, so I always grab Palmer’s Cocoa butter. It depends on your preference here. I think there seems to be no problem that coconut oil can’t handle (well apart from financial problems). Coconut oil can be used among other things, for your hair, cooking, as a skin moisturiser and also to get rid of stretch marks. To use coconut oil to reduce the appearance of stretch marks, all you have to do is massage the coconut oil on either new or old stretch marks before bedtime, and rinse it off in the morning. The saturated fats that are contained in coconut oil reduce the appearance of stretch marks by fighting free radicals. 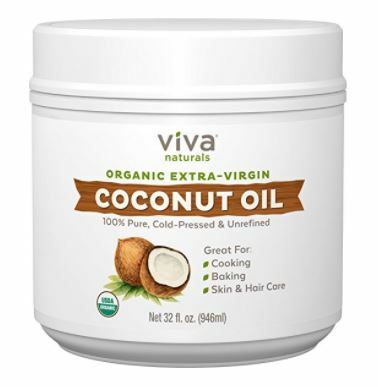 When shopping for coconut oil, go for one that is unrefined and cold-pressed like this Viva Naturals Organic Extra Virgin Coconut Oil. There are of course other remedies for getting rid stretch marks out there but these three are the ones that I have tried and have proven themselves when it comes to getting rid of stretch marks. You can try aloe vera, vitamin E, or and I have also heard that you can get rid of stretch marks by rubbing peeled raw potatoes onto the affected areas(especially if you are frugal). But if your pocket allows, then go with the laser treatment route to remove the stretch marks. Importantly, you can just accept the fact that you will always have those tiger stripes, and learn to embrace them. Besides, Some of the best models that we usually use as yardsticks to how we think we should look, have stretch marks. The only reason we don’t see it is because their images are wonderfully and expertly airbrushed. Do you have stretch marks? What has helped you to get rid of stretch marks? Please share your tips below. I don’t have any stretch marks but I will give this tips to my mom’s friends, thanks! I would love to share this to friends who are dealing with stretchmarks from their pregnancy and would like to try and find a solution for it. It’s good to know what products work best! I used Palmer’s every single day, multiple times a day, starting the day I found out I was pregnant with my first. It didn’t work. Not one bit. I think stretch marks play a lot from genetics and how quickly you gain weight. This is great! Every women has this questions and I’m so grateful you addressed it! 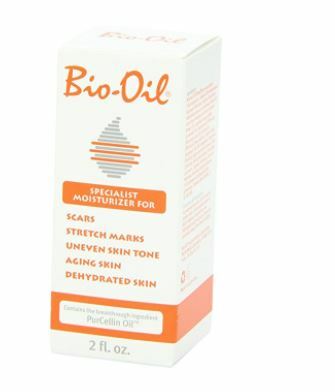 I have used bio-oil in the past and it really is such a great way to help calm stretchmarks, I’ve not tried the others but I am all for giving different ways a try. I would definitely recommend these to any of my friends and family who have stretch marks. I don’t have stretch marks but have a lot of skin that a tummy tuck would help. I will share these great tips and especially the Palmer’s oil which seems like it works the fastest. I have heard really good things about Bio Oil! I definitely have a few new stretch marks after giving birth to my first born! I can’t imagine how hard it is to accept your body after it’s changed and marks appear. It’s nice that there’s products out there to help. I love palmers cocoa butter. So great that this could help with the stretch marks. I’ll definitely share with some friends that have the need for this. Great tips for removing stretch marks. I used coconut oil when I was pregnant with my kids and that seemed to help a little bit. I think most importantly you have to keep your still healthy by moisturizing. I have some very heavy and deep stretch marks from my first born that I would love to reduce. I do have the bio oil so I really should use it more. I have an abundance of stretch marks. I have never been able to really find anything that removes them, but they can get lighter temporarily. I need to get some more bio oil. My son wrecked my body! I got nothing with my daughter, but my son, oh man did i end up with stretch marks. The women in my family are quite fortunate to not suffer from stretch marks. No one has them, so it must be something in our DNA. Still, I know women go mad for Bio Oil, it appears to work wonders. I am not surprised to learn that coconut oil helps decrease stretch marks. I’ve used coconut oil since I was a child, my family makes their own since I can remember. It has so many good uses! when I was pregnant I used this all the time! I never got stretch marks! I don’t have stretch marks but when and if I do,I’ll check these products out. These are all great tips! I have to say that I have tried them all too…Love the Bio Oil and Coconut Butter! Palmer’s has been around for what seems like forever… and for a good reason! It REALLY works. So interesting that coconut oil helps with this! Seriously, what can’t coconut oil do? It’s like a miracle product! I LOVE Palmer’s Cocoa Butter. It’s been the best weapon against stretch marks in my experience. That said I’ve stopped worrying about them ? I hadn’t thought of using coconut oil! It really can do everything… Shall have to try this as the summer months are coming and I have some on my thighs and backside! I used coconut oil twice a day from the moment I found out I was pregnant. I wanted the oil to get absorbed by the deep layers of the skin by the time my belly started to stretch. From about the 5th month I started drinking collagen type 1 & 3. And I didn’t get any stretch marks whatsoever.